The Fargo-Moorhead RedHawks have re-signed Fargo native LHP Jake Laber and signed RHP Chase Johnson, who was acquired from the Amarillo Sox via trade on Monday. 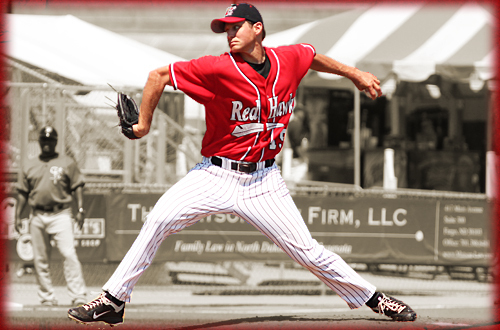 Laber, 26, was 7-7 with a 5.02 ERA in 20 starts for the RedHawks in 2012. He allowed 76 runs (64 earned) on 135 hits in 114.2 innings pitched. Laber struck out 57 batters and walked 57 batters last season. Laber has pitched for his hometown team for the past three seasons, and began his professional team with Fargo-Moorhead in 2008. In three-plus seasons with the RedHawks, Laber is 28-20 with a 4.21 ERA and a save. He has struck out 245 batters in 398.0 innings pitched. Laber is 41-27 with a 4.24 ERA in his professional career, which includes the 2008 and 2009 seasons with the River City (MO) Rascals of the Frontier League. Johnson began his professional career in 2009 after being selected by the Philadelphia Phillies in the 21st round of the draft. He spent three seasons in the Phillies organization before signing with Amarillo last spring. In his four-year career, he is 10-14 with a 3.83 ERA and 27 saves in 123 games. Johnson has struck out 177 batters in 176.1 innings pitched.